I want to create a report in which it should be retrieving the account team members with his/her related accounts and contacts. I tried custom report type and joined reports. But couldn't get the intended output. This answer is specific to Classic. You may need to create Joined Reports in this case. Refer to the image below as a reference, if that's how you want it. The joined report format lets you view different types of information in a single report. A joined report can contain data from multiple standard or custom report types. In your case, you can create two different summary reports with Account & Contact and Account & Account Team Member report. Then you can join the report and group by say Account Name to be able to present it the way you want. 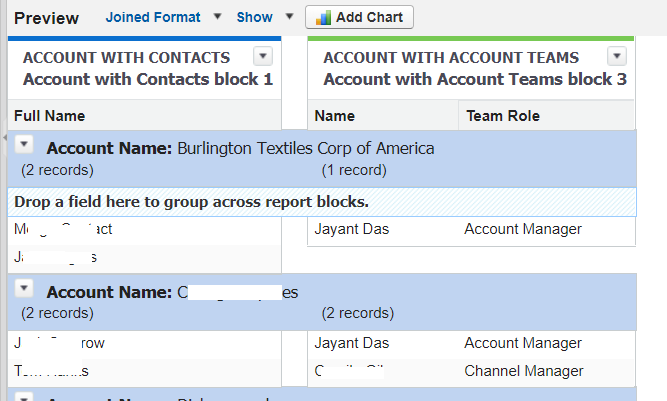 Additionally, you can create custom report types to have these information captured separately and then join on reports created using those report types. You can find more on Custom Report Types and Joined Reports in the help article. Not the answer you're looking for? Browse other questions tagged account custom-report-type joined-reports custom-reports account-teams or ask your own question. How to create report with nested accounts and custom object?